She was Regional Director of the IFC, Country Director for the WB and she was also Adviser to the Managing Director of the WB for Africa, Europe and Central and South Asia. Dr. Songwe was a Visiting Researcher at the Federal Reserve Bank of Minnesota and at the University of Southern California. 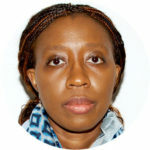 She holds a PhD in Mathematical Economics, a Master of Arts in Law and Economics and a Diplôme d’études approfondies in Economic Science and Politics. She also has a Bachelor of Arts degree in Economics and Political Science from the University of Michigan.